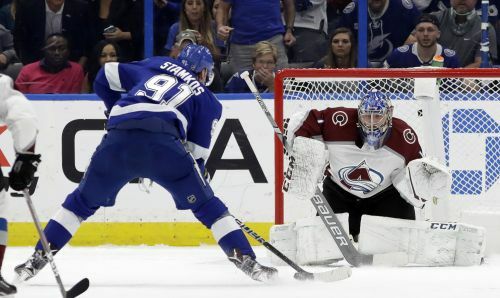 TAMPA, Fla. (AP) — Steven Stamkos had two goals and two assists and the NHL-leading Tampa Bay Lightning won their sixth consecutive game, beating the Colorado Avalanche 7-1 on Saturday night. Tampa Bay also got two goals from Ondrej Palat, and Louis Domingue made 29 saves. Tyler Johnson, Alex Killorn and Anthony Cirelli added goals. Nathan MacKinnon scored for the Avalanche. Semyon Varlamov was pulled midway through the second period after allowing five goals on 23 shots. Colorado's Mikko Rantanen got his NHL-leading 48th point with an assist that extended his points streak to 11 games (14 assists, 19 points). COLUMBUS, Ohio (AP) — Alex Ovechkin scored his NHL-leading 22nd goal and Braden Holtby got his 34th career shutout in Washington's victory over Columbus. Holtby finished with 28 saves. Travis Boyd had a goal and an assist, and Brett Connolly and Dmitrij Jaskin also scored for the defending Stanley Cup champions. Ovechkin extended his points streak to 11 straight games, with 10 goals and six assists during the stretch. He also picked up an assist on Boyd's third-period goal. BUFFALO, N.Y. (AP) — Claude Giroux had a goal and three assists to lead Philadelphia past Buffalo. James van Riemsdyk added a goal and an assist to help the Flyers open a five-game trip with their third win in 10 games. Ivan Provorov, Wayne Simmonds, Dale Weise and Travis Konecny also scored, Michael Raffl had two assists, and Anthony Stolarz made 28 saves. Jack Eichel scored twice for Buffalo. The Sabres have lost five in a row after winning 10 straight. LOS ANGELES (AP) — Derek Forbort had a goal and an assist, Jonathan Quick made 29 saves and Los Angeles beat Vegas. Nikita Scherbak, Matt Luff, Jeff Carter and Nate Thompson also scored to help the Kings tie their season high from a 5-2 victory over Edmonton on Nov. 25. They have two wins in their last five games, and have a league-low 23 points and 65 goals. Oscar Lindberg scored for Vegas. The Golden Knights had won seven of eight. SUNRISE, Fla. (AP) — Kevin Hayes had the deciding goal in the third round of the shootout, lifting New York past Florida. After Mika Zibanejad and Kevin Shattenkirk scored in the shootout for New York and Jonathan Huberdeau tallied for Florida, Hayes beat Roberto Luongo to end the Rangers' three-game losing streak. Hayes also had a pair of assists. Zibanejad, Vladislav Namestnikov, Matt Beleskey and Fredric Claesson scored in regulation for the Rangers. Keith Yandle, Huberdeau, Aaron Ekblad and Aleksander Barkov scored for the Panthers, and Huberdeau added a pair of assists. BOSTON (AP) — David Krejci had a goal and assist to move past Hall of Famer Cam Neely for 10th on the Bruins' career scoring list, and Boston beat Toronto to snap a three-game losing streak. Jakob Forsbacka-Karlsson, David Backes, Ryan Donato, Torey Krug and Danton Heinen also scored for the Bruins, and Jaroslav Halak stopped 29 shots. Auston Matthews, Travis Dermott and Andreas Johnsson scored for Toronto. Frederik Andersen was pulled early in the third after giving up six goals on 28 shots. OTTAWA, Ontario (AP) — Ryan Dzingel scored on a power play at 1:20 of overtime to lift Ottawa past Pittsburgh. The Penguins were called for too many men on the ice, setting up the winning power play. Thomas Chabot scored in regulation, Mark Stone assisted on both goals and Craig Anderson made 35 shots. Jean-Sebastien Dea scored for Pittsburgh, and Casey DeSmith stopped 27 shot. GLENDALE, Ariz. (AP) — Lukas Radil scored his first NHL goal to break a tie with 5:47 to play in San Jose's victory over Arizona. Joe Pavelski, Logan Couture, Evander Kane and Tomas Hertl also scored for San Jose. Aaron Dell, playing for the first time since Nov. 28, stopped 17 shots. Brad Richardson had a goal and assist, and Nick Schmaltz and Richard Panik also scored for Arizona. Adin Hill made 28 saves. DETROIT (AP) — Matt Martin broke a tie with 16:36 remaining, capping New York's comeback victory over Detroit. Down 2-0, New York rallied on goals by Casey Cizikas and Ryan Pulock. Justin Abdelkader and Niklas Kronwall scored for Detroit. CALGARY, Alberta (AP) — Oliver Kylington scored his first NHL goal and helped set up Garnet Hathaway's tiebreaking score in the third period to lead Calgary. Sean Monahan, Alan Quine and Elias Lindholm also scored to help the Pacific Division-leading Flames win their fifth straight and move one point ahead of Central-leading Nashville into first place in the Western Conference. Mike Smith stopped 25 shots to win his sixth straight. Colton Sissons and Craig Smith scored for the Predators, who fell to 0-5-1 in their last six on the road. Juuse Saros finished with 20 saves.